The names of 117 local, fallen servicemen from the Great War 1914-1918, are inscribed on the two war memorials on the Town Hall in the Market Place. During this centenary year of the Armistice (1918-2018), the Town Council has prepared 117 rocks, one with each serviceman’s name on. The rocks are being placed at the foot of the war memorials and the public will be invited to come and take them on Sunday 21st October 2018 to hide. Those who find the rocks are asked to post a picture of the rocks on the Blandford Rocks Facebook Group and to rehide them. 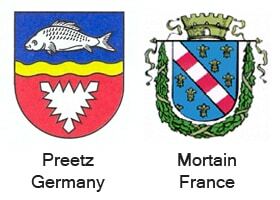 The aim is for those who find a hidden rock to visit this page of the website to find out more information about each serviceman, kindly provided by Dr Peter Reder, so they are no longer just names on a memorial but local men – fathers, sons and brothers – with a story to tell. Further evidence has been provided by William “Bill” Lovell and Mel Pollock. Please note there are some anomalies between the spellings on the war memorials and in the book. 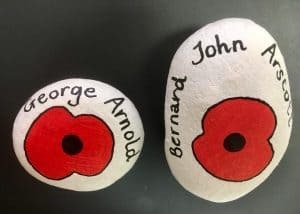 In addition, some members of the Blandford Rocks Facebook Group will be arranging a Poppy Drop where children can paint poppies onto rocks in Woodhouse Gardens (more details to follow soon). The Royal British Legion has kindly given permission for the Legion Poppy to be drawn onto each rock.